We live in a two storey house set on a slight hill. From the upper storey windows, we can see the distant view of the local shopping village and the rooftops of our neighboring homes. We can also look down into the back gardens of the homes nearest to ours. We built our home many years ago and quickly established surrounding gardens, including hedging shrubs and trees to bring privacy to our home and to block off as much view of the neighboring rooftops as possible. We also didn’t really like being able to look into our neighbor’s gardens because that meant that they could easily see us in our upper storey bedrooms. From the street, our home is set well back on the block and the land dips away so, although it is clear that the house is two storeys, it is not an imposing residence. It nestles in its garden naturally. At the rear, however, our home overshadows one of our neighbor’s properties. It must have been intimidating for them to look out their bedroom windows and see our towering two storey brick walls soaring above their back fence. Now that’s what you call ‘being overlooked.’ Not that we spent our time spying on them. We respected their privacy – but it soon became obvious how rattled they felt by the view when they planted a long row of giant bamboo right along the fence between our properties. For years, that row of bamboo irked me. Lovely though giant bamboo canes are, they are not the sort of plants you normally use as hedgerows between suburban gardens. They grow so high that their canes bow over. 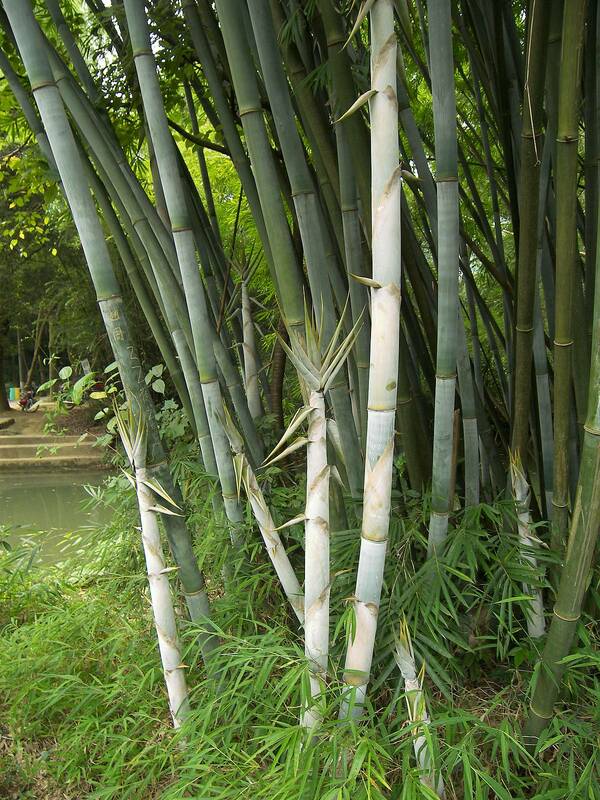 I have seen giant bamboo arching across a country road from one side to another. It concerned me that this bamboo was overshadowing our garden. I was also worried that in high winds the bamboo might even strike our home. Understanding my concerns, our neighbor did tend his bamboo crop and made sure that most of the canes stayed on his side of the fence – but the effect was that in time the wall of bamboo shut out the light into our rear garden. The flowers and grass we had initially grown there no longer thrived and we had to alter plantings and find other ways to turn mud into a walkable area other than using lawn. The canes soared so high that our views of the local village shops were obscured and we could no longer see the sky and watch the clouds from our upper storey bathroom during long soaks in the tub. On the other hand, over time, we all began to appreciate certain aspects of that green wall. We could no longer see what was happening in our neighbor’s yard. We felt so private in our own home that we often left the curtains open and sometimes walked around our home and garden in various degrees of undress. There were also a multitude of birds that loved the bamboo and often sang to us from it. I remained disgruntled but felt helpless to do much about it, and was torn by these begrudging acknowledgements. It wasn’t until our neighbors decided to move away to a home that asked less maintenance that the blessings of the bamboo wall became far more clear. New neighbors moved in to the house and loved parties at their poolside with noisy teenagers. At first, they simply thinned the bamboo wall, allowing glimpses of their activities and noise to come through. A few years later, the man of the house got sick of having to trim the new sprouting canes so often and decided to remove the bamboo altogether. It was a shock to see how quickly it came down under the loud buzz of chainsaws. It was also disastrous for my health, at first, because bamboo cane is full of cyanides and these misted up hill into our home, forming a sticky layer on furniture and briefly causing me ill health. After I recovered, the immediate effect of the bamboo coming down (besides being able to clearly see the neighbor’s property again) was that we rediscovered sunlight and the sky…These had been obscured for many years. It was hard at first to get used to that vast expanse and all the light coming in our windows. Then I realized that our ash trees were putting on a growth spurt and the jacaranda began growing branches toward the fenceline and not just toward our house. I don’t think our neighbor realized that what seemed to be struggling shrubs on our side of the fence were actually ash trees that would one day provide a good screen by themselves if they had half a chance to grow properly. He has now planted golden cane palm trees right alongside the same palings. These may not grow as tall as the bamboo or arch over our yard but they have been planted so close to the fence that they will also one day crowd our trees and overshadow the garden. I hope the ash trees can establish a good canopy before that happens, so they don’t struggle so much next time. At least golden cane palms take a lot longer to get to that height than giant bamboo does! The saying goes that you never appreciate what you have until it is gone. Once the bamboo was gone, the strong winds that used to cross our garden and once ripped a patio pergola to shreds came back. Giant bamboo is often used as a wind break and it was only after the green wall was no longer there that we realized how many years we had a sheltered and private little garden, even if it was super shady. Now, the multitude of windchimes hanging on our back porch don’t just pleasantly tinkle but play a strident cacophony…. The ash trees also grow fairly slowly so have not created a wind break of their own yet. We have since been appreciating the twinkling of neighboring street lights above the rooftops at night and seeing the distant mountains looming grey above the treetops in the early mornings, for as long as those views last. They will one day be obscured again. We’d come around to thinking that while we had lost our privacy on that side of our house, at least we still had the bush blocks behind our rear fence. Ever since we first bought our land, those blocks have been overgrown with native bushland, even though houses did sit toward the distant road on those same blocks. When we first arrived, there used to be wallabies hopping through that scrub land but then the owners agisted horses and the wallabies went away. What remained, though, was like a personal bird watching haven for us, where butterflies, birds, possums, lizards, and pythons lived and thrived. We felt very blessed to have that view at our rear (and no sign of the houses). So once the bamboo screen to the side of our rear garden was gone, we turned our focus on appreciating the private, natural space the bush land created at the back – until the day chainsaws and chippers woke us one long weekend and kept waking us up for the week after that. With so many large bush blocks now being sold in our area to build small residential plots, our rear neighbors had succumbed and removed all the scrub land and habitat we had appreciated for so long. If we were shocked to see the sky and felt exposed by being able to view into our side neighbor’s yard, it was nothing compared to not only seeing the house built on the ‘no longer bush’ block but the whole estate road beside it and every bit of traffic traveling on it. My bedroom once seemed like a tree house, looking out to treetops of eucalyptus, white cedar, etc. Now, those views are memories, too. The bird life has relocated to the bush block next door, though I can now hear some of the little boobook owls in the trees in our front garden. The possums still feed from the bowl we placed on our back fence and I hope we’ll be able to keep that up once houses are built back there. All we can do is wait and see. The upshot to all this was the reinforcement of the old tenet that life is so changeable. Even when you think things are secure and that you can rest on your laurels and just enjoy the results, something comes along to stir them up. Nothing is set in stone. Some things take longer to change than others but change is always inevitable. The enlightenment to be had from that upshot was that at every stage of change, despite the initial shock and the removal of a comfort zone, all life adapts. The birds moved habitat. The possums found some other place to live and still come back for their scraps. The little honeyeaters that used to inhabit the bamboo hedge now flit closer to our house and into our garden. instead. We may no longer have privacy in our rear garden but when we sit and dine on the pool patio, it’s quite interesting watching the traffic roll in and out of the nearby estate. Such things gave me cause to reflect on other shocks and changes that have happened in my life in recent years, especially in personal relationships. Even people you counted on being with you to the end of days can up and disappear, off to find new adventures by themselves. It can be hard to let go, hard to accept that such things are over, even when you know deep inside that they came to a natural end. Changes are often a shock, especially where life has become extremely settled and predictable – but life is also versatile and adaptable. If we can be flexible enough to move with the flow instead of against it, the pain and traumas of change fade away, eventually. That’s how life moves on. I once begrudged the existence of that wall of delightful bamboo because of the sacrifices that had to be made to allow its existence – the loss of my planned gardens, etc. Yet in truth, it brought much to my life that I hadn’t fully appreciated until it was forever gone. In the end, I’ve learned from these experiences. Today, while acknowledging the discomfort of change, I am letting that discomfort ride. I am waiting things out and trying not to be disgruntled. I am listening to the birds and taking their cues for adaptation. I am trying to flow with life and not to hold it back. I know that all change, too, is passing. Change is a pendulum, swinging between the active and the passive phases of life, into and out of our comfort zones. So there will come other comforts in the future to replace those that are lost. All I have to do is keep on plying my life and wait things out.